From the sound of the beans while being ground, to the wonderful aroma as water passes through the fresh grinds, to the beautiful cup presentation, and the sensation on the tongue as the hot coffee enters your palate… Coffee, it’s not just a beverage, it’s an experience. Captain Kimo and FastCafe.com would like to dedicate this Essentials section to world class baristas and the way all of these senses are revealed, in making the perfect cup of coffee. Also, we will have tips on how to brew the perfect cup, coming very soon. Making coffee yourself can have a big impact on your wallet! Cutting out just one “Tall” latte each day and replacing it with a premium coffee you brew yourself and enjoy in your favorite mug can $ave you more than $1,200 a year. One pound of coffee makes approximately 30 cups of coffee! An entire POT of coffee will still cost less than a GLASS of wine from a $10 bottle. When you brew your own at home, you can feel free to drink up and $ave money at the same time! The 100% Jamaican Blue Mountain Coffee is roasted to a full city roast. It’s considered black gold and known for it’s treasured flavor by many. This very rare coffee has a sweet smooth, mild flavor in a balanced cup. The 100% Kona Coffee is roasted to a full city roast. It comes from the island of Hawaii, also known as the Big Island. This Kona Coffee is well known by over 7 million annual tourists to the State of Hawaii. 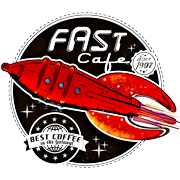 FastCafe has a fast and simple buying experience . We offer a progressive discount wich simply means, the more you buy, the larger your discount will be. Shipping is FREE when you buy 2 or more lbs via USPS Priority Mail. We ship the same or next day 99% of them time. Discount Chart: Listed below is a simple chart. When you purchase the following X lbs of coffee, you will receive X dollars per pound discount with a maximum discount rate of $6.